Seeds few to numerous, flattened or globose; endosperm copious and hard; embryo small. 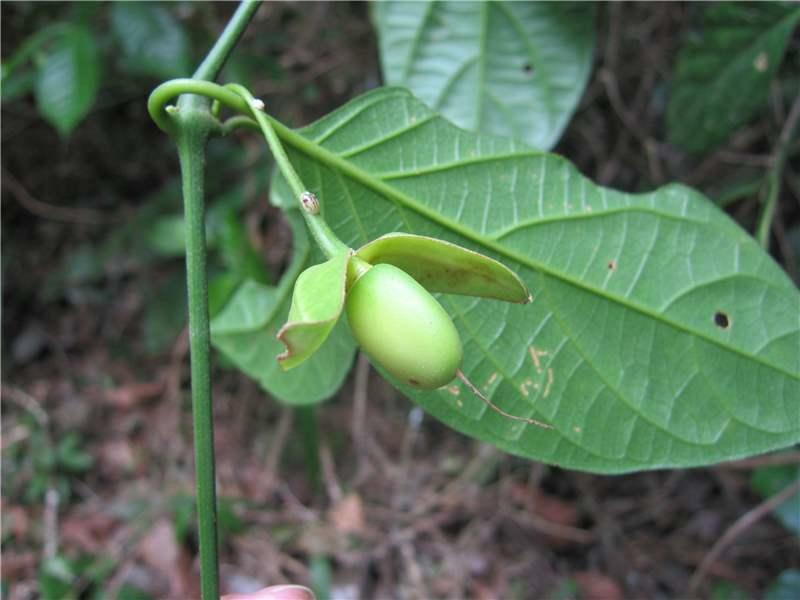 Erect or climbing shrubs, lianas, or trees. Trees: usually less than 10 m. high (savanna spp. ), 10–35(40) m. (forest spp. ); trunk 10–100 cm. in diam. ; without tendrils, often with arching branches (iS. usambarensis, S. xantha). 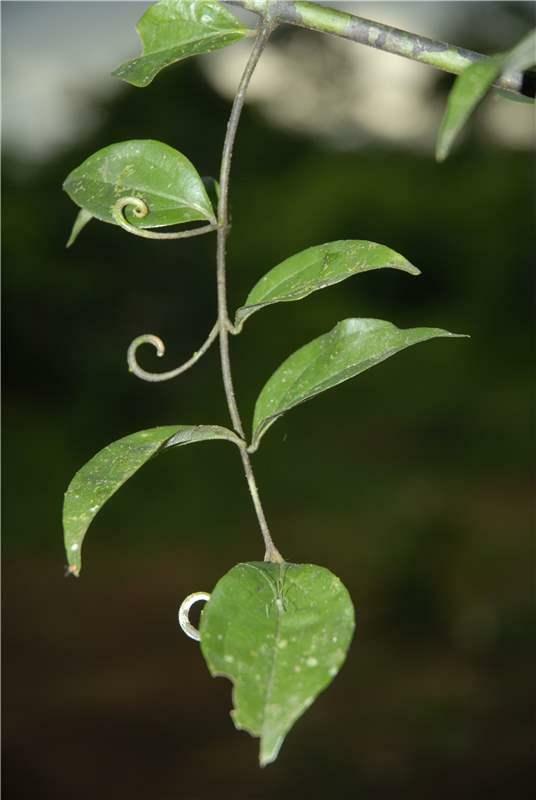 Lianas with curled tendrils, solitary or arranged in 1–3 pairs above each other on short branches, in the axils of small bracts or — only if solitary — sometimes in the axils of ordinary leaves. Branches armed with axillary or sometimes terminal simple straight or slightly recurved spines, unarmed, often lenticellate, rarely corky; branchlets terete, quadrangular, sometimes sulcate, especially when dry. Wood mostly hard, usually with bark–islets; bark mostly thin, smooth or less often rough, in lianas often with large lenticels, sometimes thick and corky (S. cocculoides). Stipules mostly reduced to an often ciliate and straight rim connecting the petiole–bases. 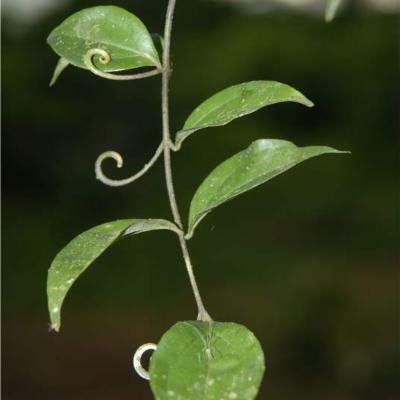 Leaves opposite, sometimes decussate, or on the main axis sometimes ternate, those of a pair or whorl equal or subequal, petiolate or sometimes subsessile, mostly inserted on distinct leaf–cushions; blade variously shaped, orbicular to narrowly elliptic, mostly coriaceous, in the shade thinner, often larger, and more acute at the apex, entire; with 1–2(3) pairs of distinct secondary veins from or from above the base curved along the margin, usually not fully reaching the apex, anastomosing with the other veins or less often pinnately veined. Inflorescence terminal, axillary, or both, thyrsoid, 1–many–flowered, shorter or longer than the leaves, lax or congested, sometimes sessile. Flowers 4–5–merous, actinomorphic or with only sepals unequal. Calyx: sepals green or coloured approximately like the corolla, free or connate up to one–half of their length, equal, subequal, or sometimes unequal, imbricate, orbicular to linear, outside hairy or glabrous. Corolla rotate to salver–shaped, white to yellowish, greenish, pale green, or rarely orange or ochraceous, thin at the base, always more or less thickened towards the lobes, on both sides variously hairy, papillose, or glabrous, but inside at the base always glabrous, sometimes with a corona at the mouth; lobes valvate in the bud, triangular to oblong, acute or subacute, entire, erect to recurved. Stamens exserted or included, inserted at the mouth of or in the corolla tube; filaments glabrous or sometimes hairy; anthers introrse, orbicular to narrowly oblong, cordate, deeply so, or less often sagittate at the base. Pistil: ovary 2– or rarely 1–celled (S. mellodora, S. spinosa); stigma capitate, less often obscurely bilobed, or occasionally conical. In a one–celled ovary one basal placenta which is mostly globose, with few (S. mellodora) or many ovules (S. spinosa). In each cell of a 2–celled ovary one axial placenta with 2 to about 50 ovules, attached to the middle of the septum. Fruit a berry, 1–2–celled, globose or nearly so, mostly yellow to red, less often green when mature, sometimes blue–black (S. potatorum), immature often glaucous, glabrous, subtended by the persisting calyx, 0·8–18 cm. in diameter, 1–45–seeded. 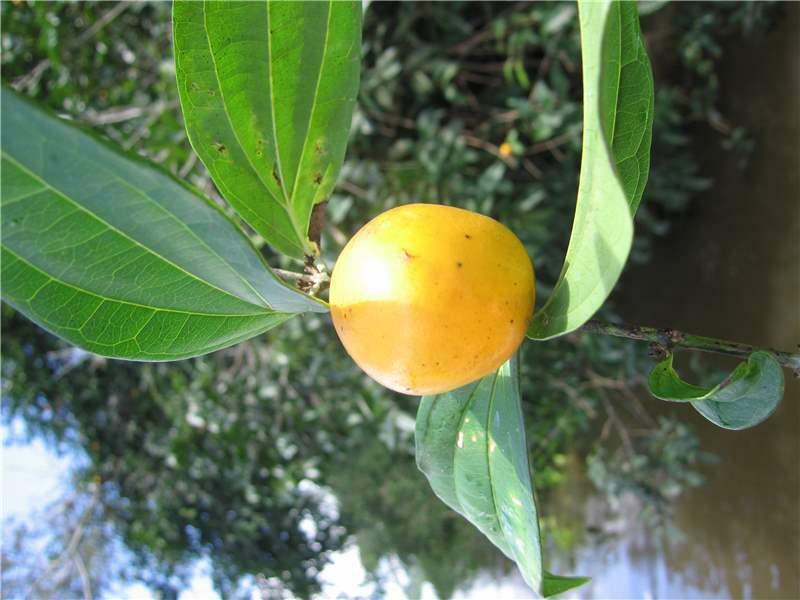 Pulp juicy, fleshy, often edible (S. cocculoides, S. madagascariensis, S. pungens, S. spinosa, and also in some small–fruited species). Wall thin and soft in small fruits, thicker and brittle in (mature) larger (very hard in nearly mature!!). Testa thick and osseous to very thin and membranaceous, rough and scabrid–pubescent (only when thick) or smooth and sericeous to glabrous. 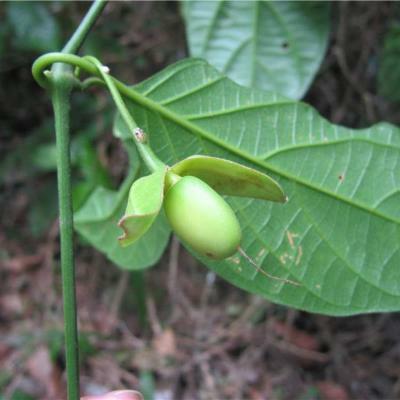 Seeds large, 0·5–3(5) cm. long, variably shaped, generally disc–shaped to subglobose. Endosperm horny, slightly diaphanous. Sometimes some colleters above the bracts, on the base of the sepals, and near the base of the petioles. 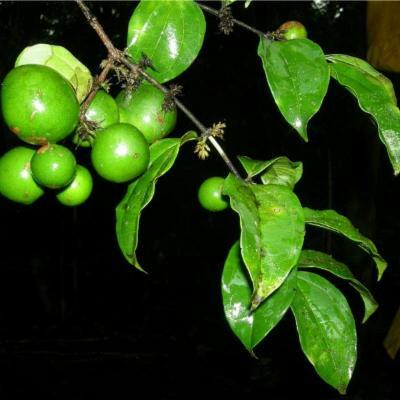 Strychnos brachiata Ruiz & Pav. 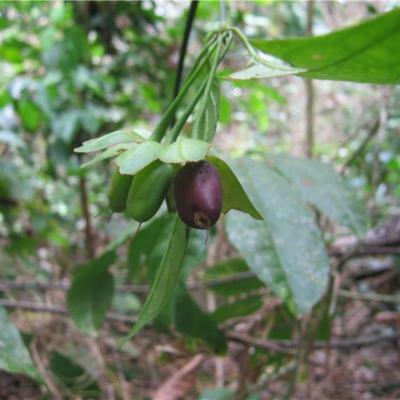 Strychnos campicola Gilg ex Leeuwenb. 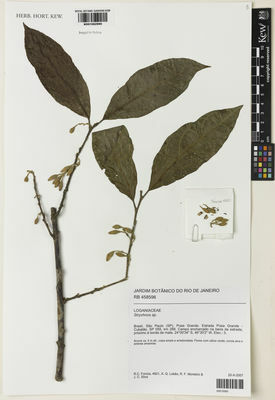 Strychnos dantaensis Manoel, Carrijo & E.F.Guim. Strychnos duckei Krukoff & Monach. 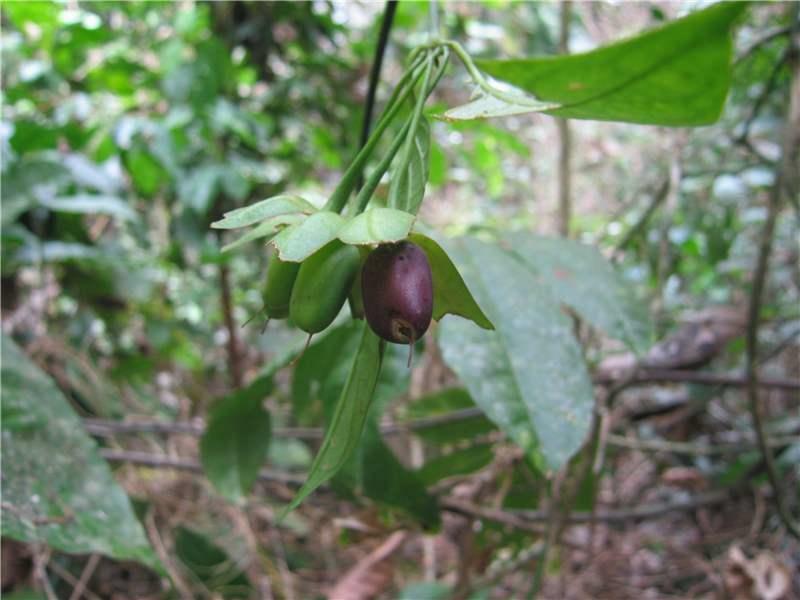 Strychnos elaeocarpa Gilg ex Leeuwenb. Strychnos jacarepiensis Manoel & E.F.Guim. Strychnos melanocarpa Gilg & Gilg-Ben. Strychnos mimfiensis Gilg ex Leeuwenb. Strychnos parviflora Spruce ex Benth. Strychnos rondeletioides Spruce ex Benth. Strychnos subcordata Spruce ex Benth. 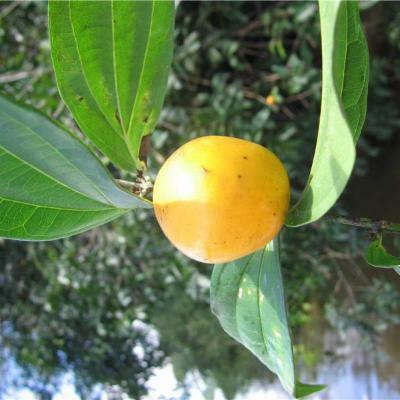 Strychnos ternata Gilg ex Leeuwenb. Strychnos torresiana Krukoff & Monach. Strychnos toxifera R.H.Schomb. ex Lindl. 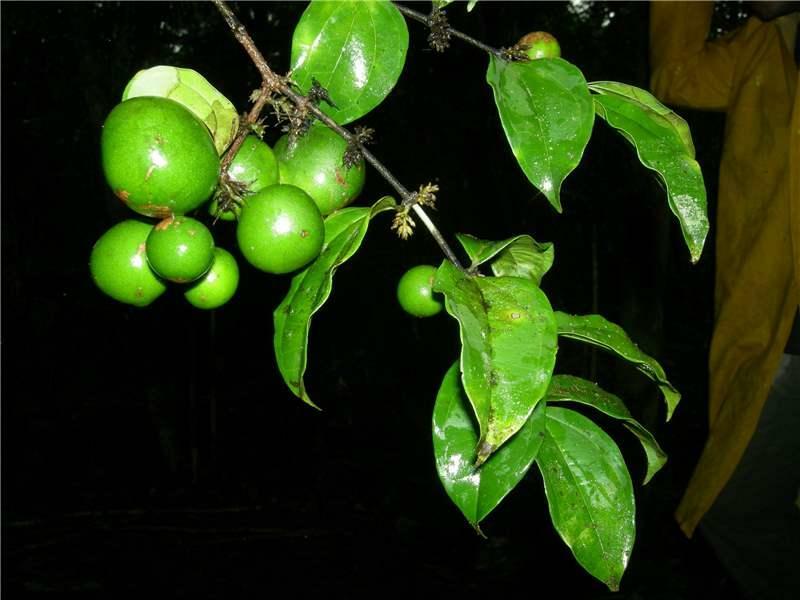 Strychnos wallichiana Steud. ex A.DC.